The expansion for the superb talented barbarian clocks in at 10 pages, 1 page front cover, 1 page credits, 1 page SRD, leaving us with 7 pages of content, so let’s take a look, shall we? A total of 4 new edges are provided – one to make an animal whisperer (wild empathy, then non-magical charm effect -wrap your head around that! ), one to further improve cleaving, one for a mule-style barbarian with more carrying capacity/better str-checks and one to grant immunity versus compulsions, but with the caveat of including a higher-HD-by-4-caveat similarly to how sneak attack versus those tentatively immune to flanking is handled. A total of 24 talents are also part of the deal, covering wild empathy, being able to appraise non-magical objects/getting a kind of pidgin means of communicating simple concepts, speaking with animals of her form while skinwalking at will, one that lets you treat a very select array of weapons as a lighter category, improvise objects, becoming harder to get by failing respective saves and gaining bonuses while under negative conditions. The latter is a problem, at least a minor one – while I get the design intent here, the reality of the game will see more than one barbarian with this talent asking his/her compatriots to inflict e.g. bleed damage on them to get the melee damage boost (hey, +2 to damage ain’t that shabby…) – too metagamey in the way it will be (mis-)used for my tastes. Kind of weird would be head smash – unarmed attacks with the head, executable sans AoO and even when grappled or pinned, but deals half damage to the barbarian. Again, I like the idea, but the execution would probably not see me ever take it unless I had a DM who used super-grappler foes all the time. On the other end, half damage from all falls and never landing prone when falling AND +2 to CMD versus trips? Yeah, can see that one. Rather disappointing for me was also the way in which blood oaths are portrayed herein – when below half max hp (Hello, 4th edition design! ), a barbarian may once per day choose one of 4 bonuses – none of which are too strong and require line of sight with the target of the oath and a relatively short duration, but still. Kind of anticlimactic and not like an epic blood oath of vengeance, more like a minor revenge theme. Better bracer-fighting and a talent that nets bonus hp when not wearing armor and the like, on the other hand, help quite a bit with some character concepts. One of the 4 greater talents allows you to execute two combat maneuvers at once as a standard action and -2 to either. A complex one here…on the one hand, there is nothing per se wrong with this one per se thanks to the action-economy-caveat, it is still one that somewhat leaves me with a bit of hesitation, especially with the grand talent that 1/round allows the barbarian to add yet another maneuver to a combat maneuver or attack – and since there’s no other caveat, that means potentially three combat maneuvers in one attack – and I *know* there are some creature/build combos that can do very nasty things with combos like that… Getting a final attack when being downed or killed on the other hand is a rather neat one. We also get 7 new rage powers and they are interesting – more CMD and more importantly, an AoO if a maneuver fails against the raging barbarian (even if otherwise not provoking one from the barbarian) -yeah, these I can see. Draw Aggression deserves special mention – when a foe the barbarian threatens targets a foe other than the barbarian with a spell, ability or attack, the barbarian gets an AoO – add reach, have fun. Seriously, nice way of making the aggression drawing work. Getting a free round of rage for being critted, on the other hand, at least theoretically fails the kitten test in a very minor way – while theoretically, the rage could be infinitely prolonged by crits of declawed kittens, in practice, it’ll be hard to maintain. Still, not particularly elegant design in my book. Getting a shaken-inducing defense versus mind-inföluencing effects on the other hand – yeah, neato! Ditto for inciting minor, detrimental rages and a fast intimidate (swift or immediate action) upon entering a rage. The pdf concludes with a list of the edges, talents etc. by theme – nice to have! Editing and formatting are top-notch, I didn’t notice significant glitches. Layout adheres to Rogue Genius Games’ 2-column portrait standard with thematically fitting color stock art. The pdf comes fully bookmarked with nested bookmarks for your convenience. Hmm…this one left me with mixed feelings. On the one hand, the further exploration of skinwalking/animal-whisperer-style tricks is cool – as is the fact that some of the abilities herein make vambraces more viable and help unarmored barbarians. The thing is – they, at least in my book, don’t do enough to offset the downside of not using armor in the long run – some further talents/edges to improve this conceptual path would have been more than cool. After all, unarmored barbarians, frothing at the mouth while charging those pansies in their shining mail are a staple of fantasy art – a step further in that direction would have been awesome. Usually, the “More X Talents”-series has provided some of the more iconic, cool talents, unique options etc. – and this one does so as well…but also uses quite a bunch of rules-solutions that are slightly less elegant than what I’ve come to expect from the series. Overall, a few of the talents herein left me either shrugging or simply not sold on their viability. Now don’t get me wrong – chances are, you’ll find at least some cool tidbits to use herein, but compared to previous installments, this one’s mechanics felt a tad bit less streamlined to me, with some reflexive abilities tied to negative conditions and the like. While the wording is water-tight enough to prevent copious abuse, some minor metagamey moments might well arise from this one. All in all, I can bring myself to rating this higher than 3.5 stars, rounded down to 3 for the purpose of this platform, with the caveat that talented barbarian-fans should probably still take a look, but carefully check with their DM regarding the talents herein. 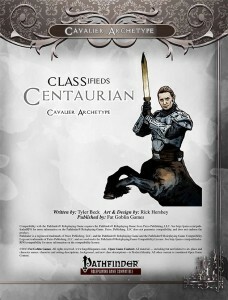 You can get this expansion to the awesome original pdf here on OBS and here on d20pfsrd.com’s shop. 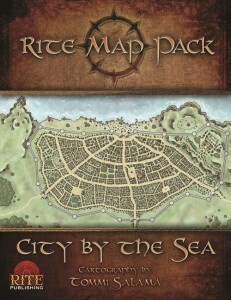 This map pack depicts a City by the Sea on 16 pages, 1 page front cover, 1 page editorial, leaving 14 pages for the maps, so let’s take a look! The first map depicts a massive, walled city by the sea, with streets connecting organically gates with the area around the harbor and one section of the city on a hill. It should be noted that unlike Port Shaw, Freeport etc., there is no huge harbor here, but rather the harbor can be considered just one part of the city, not one of its defining, center features. The second page also has the city, this time depicted horizontal – with a truly jarring white box of text on the parchment-like header and a similarly jarring list of important buildings. Layout-wise, these white, angular boxes on a background of parchment are a total disaster that thankfully only mars this one rendition of the map – until you click on it, when the white box disappears. Printing it out, the boxes disappeared, but for those of you aiming to use this incarnation of the map online or via tablets should be aware of that. 6 pages each, both in b/w and full color, depict the city in a larger version. Tommi Salama is a glorious cartographer, and he obviously is just as at home with city maps as with battle maps – and this one comes beautiful indeed – craftmanship-wise, tehre’s nothing to complain. A minor downside would be the lack of bookmarks to e.g. the b/w-version -while a marginal gripe, it still would have been nice to see. The pdf is also accompanied by an array of 4 cool high-res jpegs with and without labels. Internal logic-wise, I also have a minor gripe – for a city constructed so all roads lead towards the harbor, said harbor is VERY small when compared to the size of the city. My final verdict will clock in at 4 stars. You can get this nice city map here on OBS and here on d20pfsrd.com’s shop. The first of the much-applauded “Talented”-treatments under Owen K.C. Stephens’ new Rogue Genius Games clocks in at an impressive 38 pages, 1 page front cover, 1 page editorial, 1 page SRD, leaving us with 35 (!!!) pages of content, so let’s take a look! So let’s take a look at the class, shall we? talented Barbarians must be of non-lawful alignment, get d12, 4+Int skills, full BAB-progression, good fort-saves and proficiency with all simple and martial weapons and light armors. They also get a so-called edge at first level, 2nd level and then at 5th level and every 6 levels after that. 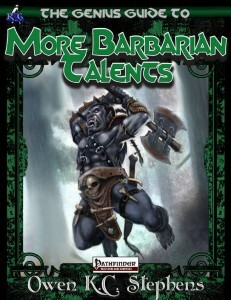 Barbarians also get a so-called talent at 1st level and every level except 5th, 11th and 17th. Starting at 10th level, advanced talents become available and starting at 20th level, so-called grand talents are there as capstones. So far, so good – that’s essentially what you had expected after the previous installments of the series. Now where things get really interesting is with the new level 1 ability Primal Reserve. A barbarian starts play with 4+con-mod points of Primal Reserve and adds +2 points. Primal reserve can be used to automatically stabilize. All core-resources that would increase rage rounds instead net primal reserve points. These, as you can imagine, make for the basic resource of the talented barbarian. Generally, a certain type of ability-tree can be gleaned herein -while primal reserve powers all the rage-like edges (rage, cod fury, berserker and also savagery), only one can be chosen – savagery allowing btw. the barbarian to add +1d6 to ability/skill-checks based on two chosen attributes other than Int for a more canny/versatile adversary. Additionally, rage powers and the like can be used by barbarians with this edge even when not in rage. This makes for an interesting inherent design-decision, also by adding additional benefits according to the rage chosen – berserkers getting e.g. free proficiencies and the like. Skinwalking and the oracle-mystery-wildering totems also are part of the deal -and before you get out your power-gaming utensils – skinwalking/totems have a caveat that helps them not stack at the lower levels, but which still makes it possible to combine them, should you wish to. Skinwalking? Yep, essentially wild-shaping fuelled by primal reserve, opening a vast array of new character concepts. And before you ask – the ability is balanced re animal modes of movement and attacks, requiring higher levels to turn into predators and the like – nice! It should also be noted that barbarians are explicitly allowed to wilder in the rogue’s talent selection via a specific edge, increasing your potential arsenal even further. We also get an index that groups the respective content according to theme. Very interesting indeed – beyond the by now traditional advice on how to handle synergy between talented classes, we get essentially a suggestion called heroic warrior, who is a synergy of fighter, barbarian and cavalier for those who wish to play in all toolboxes sans breaking the game -really like that one, though a full-blown table for the class would probably have been nice. Editing and formatting are very good, I didn’t notice any significant glitches. Layout adheres to RGG’s printer-friendly two-column standard and the pdf comes with thematically-fitting stock art and is EXTENSIVELY bookmarked with nested bookmarks for each edge, talent and rage power. It also comes hyperlinked to d20pfsrd.com, though not with the perfect bookmarks, but rather the automated ones – I doubt that customers require “GM” to be hyperlinked and more than once, I clicked by accident on a hyperlink, in the end printing this out to avoid just that. Oh well, at least the hyperlinks per se aren’t obtrusive. Back to a more positive topic – the content. This takes the slobbering, wrath-filled barbarian and, as the intro suggests, separates it from the savage warrior, essentially allowing for non-raging barbarians from less urbanized cultures to civilized people who need anger management classes to shamanistic warriors that may slip in and out of animal skins – the barbarian as reimagined herein is much more versatile than the base class it inspired, offering much, much more in the variety of character concepts it supports – and that, ladies and gentleman, is why this one, much like the other talented classes before, now is the standard at my table. f problems can be found herein, they are minor at the very best and not the result of the class, but of the base archetype-abilities the framework took and adapted. And, let me emphasize this, even these minor hick-ups do not detract from the usefulness of this class in the slightest – final verdict: 5 stars + seal of approval. 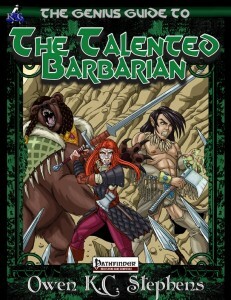 You can get this cool version of the Barbarian-class here on OBS and here on d20pfsrd.com’s shop! 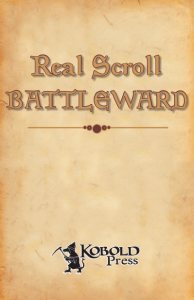 And now for something completely different – today I’ll take a look at Kobold Press’ Real Scroll-series, which portrays one spell per installment in a lavish, hand-crafted calligraphy. Each of these pdf is 4 pages long – 1 page front cover, 1 page SRD/editorial, 1 page regular text of the spell and 1 page for the real scroll calligraphy version of the spell. These reviews are not about content – they are about aesthetics and as such, much more so than my regular reviews, I invite you, the reader, to take these as just that – my personal preference and opinion regarding these. Got that? Great! It should be noted, that the scrolls don’t contain arcane gibberish, strange runes or glyphs or the like – they contain the spell’s description and rules, rendered in lavish calligraphy – and that’s it. whether these are worth it for you as a customer depends very much on how excited you can get about beautiful calligraphy, here rendered by Kathy Barker. So let’s check the spells! #1 is all about the iconic fireball, with massive Initials, wonderful ligatures and the text superimposed over the awesome rendition of a fireball, with the scroll itself having a somewhat scorched, parchment-like look and a caveat on the proper storage of these scrolls at the end – glorious 5 star + seal of approval material in my book. #2 depicts battleward and is more light -with two small heraldic crests depicting a portcullis and a sword-like icon superimposes on a sun-light background flanking the spell’s name, ethereal blueish wisps stretch towards the middle of the text from the upper right corner – per se very elegant, but I miss the custom background, this scroll having only a stark white background and the scroll has too pronounced white borders for my tastes. The two lavishly rendered, beautiful initials of the text deserve mentioning, though. 4 stars. #3 portrays Fire Under the Tongue, with somewhat organic/leaf (or flame)-like embroideries to the side of the spell. As an awesome touch, several of the letters feature flame-like extensions and the penultimate “f” of fire in the line that includes the mythic and augmentation options rounds perfectly the space of the page. The scroll comes with a fitting, red border and, as with the previous installments, the ligatures deserve special mentioning for their aesthetic value. Instead of one-letter initials, we have bolded letters in this case and personally, I prefer lavish initials over the (comparatively) common bolding of first words in a paragraph. 4.5 stars, rounded up to 5. #4 is all about Gear Barrage, with a lot of swirly, brown lines at the top and bottom of the spell, each of the brown lines ending in a turquoise dot and spirals adhering to a similar schematic denoting the respective lines of the mechanical information for the spell.. The spell’s title is the star here – with turquoise letters and brown borders of said letters, the title is just a beauty to look at. The borders of the scroll this time around are brown. While the embroideries and spirals of the text this time around rank among the best I’ve seen in the series, this scroll also suffers from there just not being that much text – the scroll features significantly large borders, with the text being not perfectly centered and more left-aligned, lending to an impression of the scroll being simply not that well-used – larger letters, more pronounced embroideries, something like that could have made this one truly stand out. 3.5 stars, rounded up to 4. Now If you enjoy artfully crafted calligraphy or have tried your hand with it yourself, if you’re an aesthete, then these will be worth the asking price indeed. If you’re just out there for the crunch, then you might want to skip these. Personally, I hope the series continues – for I’m convinced that RPGs ARE art and crossovers/crosspollinations of different types of artistry tend to result in favorites of mine. I know I’m looking forward to when I can hand out a scroll of fireball to my players and watch their astonished faces! You can get the fireball here on OBS! You can get the battleward on OBS here! 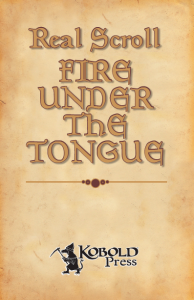 Fire Under the Tongue can be found here! 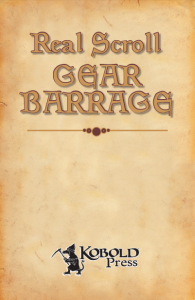 And finally, Gear Barrage’s scroll is here! This map-pack is 35 pages long, 1 page front cover, 1 page editorial, 16 pages of full-color map and 16 of the same as b/w. So this would be a new gorgeous full color map with a gorgeous grid – so what is on this map? We get a river, full of dynamic-looking foam and different depths, with several large rocks jutting out of it and a short section of sands on both sides – at least up to the beaver dam that can be found in the upper third of the river – the river making its way through two massive breaches in the dam. The maps come with a grid. Water is hard to get right on maps and Tommi Salama creates water that is gorgeous – whether the dam, the jutting rocks – this map is beautiful indeed and the pdf comes fully bookmarked, which is a definite plus. This map-pack is gorgeous – Tommi Salama can be considered the heir apparent of map legend Jonathan Roberts if this pdf is any indicator. Now, personally, I think a version sans grids (or with hex-grids) would have been nice to have, but all in all, that’s not enough to rate this down a whole star – hence, my final verdict will clock in at 4.5 stars, rounded up to 5 for the purpose of this platform. 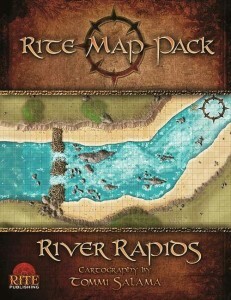 You can get this cool map-pack here on OBS and here on d20pfsrd.com’s shop. This book for the mean DM is 82 pages long, 1 page front cover, 1 page editorial, 1 page ToC, 2 pages of SRD, 1 page back cover, leaving us with 74 pages of content, so let’s take a look! So…Bill Webb has somewhat of a reputation for not only being FGG’s mastermind, but also for being a capable and deadly DM – one I didn’t yet have the honor to play with, but from what I’ve heard – wow. 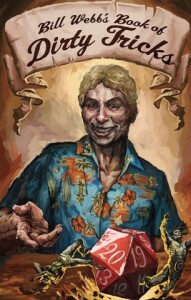 And this book, well, it contains some of his nastiest tricks – which makes for an interesting read, so let’s see if even jaded DMs like your truly can draw some neat tricks out of this one! The pdf kicks off with an introduction -and something that makes the book rather interesting in sensibility – Bill’s game is a blend of old-school, Sword & Wizardry and 3.X/PFRPG sprinkled in and hence, throughout the book, Skeeter Green has boxes, where he explains changes in terminology in the system, provides spell-conversions into a given system and generally elaborates peculiarities, making this book MUCH more useful than it would be otherwise. All right, got that? One glorious house-rule herein is rather interesting -XP for GOLD SPENT. No, seriously – think about it: Clerics building temples and sniffing good incense, paladins giving alms, rogues and fighter gambling and whoring -it makes for a great way to handle e.g. XP gained via downtime etc.- even better if you want to have leveling actually take some time and entail some…things that happen. A great roleplaying catalyst! Alternate weapon damage, attributes and bonuses, travel etc. are also provided, though these will probably primarily be a godsend for DMs who want to defuse the rules-heaviness of PFRPG’s crunch, for they represent essentially concise, but still a bit quick and dirty simplifications. Now the “got lost” charts and rolls on the other hand are truly awesome and simple for just about every system they’re used in -especially thanks to proper survival DCs etc. also provided. Simpler rules for food and drink, foraging etc. are also in here – more interesting and yet another godsend-level table would be the concise 50-entry-three column table to generate unorthodox door opening mechanisms – so simple and yet so flavorful – awesome! This also extends to actual specific trigger-mechanisms for traps. We all have been there – the moment where players just are incredibly LUCKY. I once had it happen that a PC could ONLY survive by a) winning initiative (enemy rolls 1, he a 20) – he did that. Thereafter, he had to crit the foe and confirm – two twenties required, both rolled. THEN he still had to roll max damage with a d10 and 5d6 AND then, in order to not be destroyed by his godlike adversary, he would have to roll a 10 on a d10 (indicating fatal head wound) and then a natural 100 on a d% in order to manage an instant-beheading according to the crit rules I used back then. Every other outcome would have seen him SLAUGHTERED. Well, do the math – I did not expect this character to survive. He did. Players are lucky…and this one suddenly had the regalia of literally one of the most powerful warrior-lords EVER to walk the lands, plus his fortune as by custom of trial by combat. Where I’m getting at with this anecdote is – sometimes players are lucky, deservedly so – but the consequences might prove to become issues for the balance of the campaign. Hence, the next chapter is all about handling players with too much treasure via quite an array of options – several of them rather nasty, but concise and best of all: They make sense -both in a historical context of fantasy and in-game – just think about all those times in the stories and comics Conan got a fortune and was subsequently deprived of it (when he didn’t squander it to convert gold to XP, that is!) – yeah, that level of loss. Now here’s a huge issue I have as a reviewer – I *could* go into detail regarding all of the tricks, as I usually do – but that would somehow defeat the purpose of this book. As soon as the tricks as made obvious, players are more likely to consider them as such and not as just a concise development of the campaign – by exposing them, I’d hurt their effectiveness. So I’ll refrain from that – just one thing: Whether it’s an AP kind of on the wrong side of a despotic city’s law, a certain mythic incursion into an abyssal landscape or a certain kingdom-building experience – there’s a fitting trick for just about every context here. Next up would be a chapter that my players would HATE – because I’ve used similar tricks: Magical keys that do nothing, Unobtanium and similar nasty tricks and time wasters are exceedingly efficient at making players not analyze EVERYTHING – but there’s another benefit: A DM can use these tricks as blank spaces to later revisit and improvise contexts that weren’t there before, retroactively fit in storylines and the like – and no, not going into all the details of this chapter. Once again – less effective if players know what they’re up against. Now the trick-chapter is also interesting -from stacking certain hazards/obstacles to puzzle-style combat to tesseracts and portals – a lot of goodies here. Finally, we have a great chapter called “Greed is bad” – from pointing towards the timeless “Don’t drink two potions at once”-table from 1E (seriously – hunt that one down!) to some other…interesting tricks to make players stop succumbing to Karzoug’s favorite sin, this is a fitting conclusion to this nice booklet. Editing and formatting are top-notch, I didn’t notice any significant glitches. Layout adheres to a one-column b/w-standard reminiscent of small booklets like digests. The print-edition, which is btw. of top-notch quality, does also adhere to this size.The pdf provides ample, cool and iconic old-school b/w-artworks. The pdf also comes fully bookmarked for your convenience. Wow, this was an uncommon ride for me – mainly because reading this book was somewhat a blast from the past, with many tricks implicit in the old-school of adventure design properly and concisely spelled out. While the house-rules herein may not be to everyone’s liking, DMs and groups looking for simplification got one awesome resource here. Furthermore, some of the tricks are glorious, while others elicited a “D’unh” from me – the latter though, as I realized, mostly due to me coming from kind of (though not wholly – Bill Webb’s old-school credibility vastly outclasses mine!) this school of DMing. I.e. my game is lethal, PCs die and the world is not conveniently CR-stacked for PCs to slaughter. I started thinking, and relatively soon realized that most new-school modules simply don’t use tricks like these – and worse, were limited to the module, whereas most of the tricks herein actually help keeping a campaign going, not a simple module. 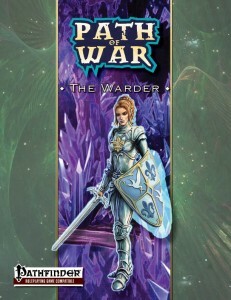 And as every DM who ran something that was not a plot-driven AP can attest, it is campaigns, with freedom, strange choices and especially sandboxes that can provide the problems this booklet combats. As such, and due to the ridiculously low price, I can wholeheartedly recommend this useful book – even if you’re a better Dm than me and know every trick in this book already, it still makes for a cool blast-from-the-past-style reading and should inspire some rules-changes/refreshing of the mentality at the heart of FGG’s success. Congrats to Bill Webb and developers Skeeter Green and Matthew J. Finch – well worth 5 stars + seal of approval. You can get this cool little booklet full of nasty tricks here on d20pfsrd.com’s shop! The third in Rite Publishing’s series showcasing the infinite worlds of the Grand Stair, this one clocks in at 11 pages, 1 page front cover, 1 page editorial, leaving 9 pages of content, so let’s take a look! So what is the Nightmare Kingdom? Well, the nightmare kingdom is, as the in-character narrative postulates…strange. Even for the Grand Stair. There is a theory postulated (which may or may not be true) that the Nightmare Kingdom can actually reach places without using the Grand Stair, drifting through shadows and luring unsuspecting beings in. Touching the infinite worlds via closets and subverting doors, the hellish conglomerate of the fears of a thousand times thousand worlds is a domain, yes, but it is also a curse that may actually claim characters as its master…though the current master/slave of the realm, the entity known as the Ghoul, might not take kindly to such an intrusion. Fears made flesh, the boogeymen, which can include anything from the legendary man with red hands to cthonic horrors, the slender man or just about any other dreadful creature you can concieve, populate this deadly place and hence, 3 different takes on handling horror in LoGaS are provided herein for a given group to use. And yes, tinseltown Hollywood, a Stephen King-inspired small town in Maine and the dark, dark cousin of NYC are provided as sample places that exist physically in the Nightmare Kingdom. Have I mentioned that in this world, psychic sustenance actually may nourish you, heal wounds and even change reality via the shaping of fears? Editing and formatting are top-notch, I didn’t notice any glitches. Layout adheres to LoGaS’ 2-column full color standard and the artworks by Trung Ta Ha, Liew, Henry Toogood, Malcolm McClinton and Vince Ptitvine are glorious – I have seen neither before and think at least the cover is original – in any way, they are GLORIOUS and drive home the creepy atmosphere of this world. 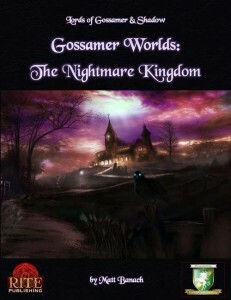 Matt Banach’s Nightmare Kingdom, indebted to Ravenloft in concept and flourish, makes for a great, terrible place to introduce to one’s campaign and offers infinite potential for deadly horror of all shapes and forms in your LoGaS-game – combined with the great mechanics and writing, I’ll settle for a final verdict of 5 stars + seal of approval. You can get this awesome little supplement here on OBS and here on d20pfsrd.com’s shop.